We're also joined by special guest, Nicole Abboud from Abboud Media. In Instagram news, you can now save Instagram live videos for later. Previously, when you created Instagram Live video content, you couldn't save them. Instagram has now rolled out the ability to download your live videos at the end of a broadcast. This way if you have moments from your live videos that you want to re-watch, you can. To download your Instagram live videos, after your broadcast ends, tap the save option in the upper corner. One important thing to note about downloading Instagram live videos. When you download your videos, they will be saved to your mobile devices camera roll. Any comments, likes, number of viewers or any live interactions will not be saved. Your Instagram Live videos also will no longer be in the Instagram app. Remember, if you are creating Instagram Live videos and they don't look or sound that great, you can improve them with these tools. If you would like to read the announcement made by Instagram, go here. In Facebook news, they are adding new ways to use Facebook Live. For the longest time, you could only use Facebook Live on mobile. Then Facebook rolled out the ability to use Facebook Live video for Mac or PC computers. By adding the ability to create Facebook Live video from your desktop, you'll have more options to create better quality Facebook Live video content. This is because when you use a desktop or laptop, you have better access to equipment such as your webcam or microphone. These are typically significantly better than the mobile device options. In addition to being able to go live on Facebook from your desktop or laptop, Facebook Live also now works with streaming software such as Wirecast, which we use for our social media marketing talk show, Social Chatter. To read more about new ways of going live on Facebook, read this article. Also in Facebook news, they have rolled out seasonal greetings. You may think that Facebook seasonal greetings, a feature to let you know about holiday's or important times of the year are unimportant. If you're a business and you're looking for ideas on what to post about or want to change your Facebook Page cover photo, seasonal greetings can give you some ideas. This is what Facebook seasons greetings look like. While seasonal greetings will only appear on the mobile version of Facebook, Facebook's goal is to boost personal sharing. Not only can this feature help with that, but it can also give you additional ideas that you can use on your Facebook Page. For example, if it's Winter, you could begin to adjust the style of your Facebook Page posts to reflect Winter. Take the time to test out seasonal greetings on Facebook and see what ideas you can come up with that you can also use on your businesses Facebook Page. In LinkedIn news, they have rolled out trending storylines. With the addition of trending storylines, LinkedIn is adding "curated interest-based feeds that surface developing stories to help you discover and discuss news, ideas, and diverse perspectives from the largest group of professionals, publishers and editorial voices ever assembled." Here is a short video on how trending storylines work. Overall, LinkedIn trending storylines reminds us of the Medium feature that we talked about on a previous episode of Social Chatter. To access trending storylines, launch the LinkedIn mobile app and look under the trending tab. If you're on the desktop, you can access it on the right hand side of the homepage. Read about the LinkedIn trending storylines announcement here. In Snapchat news, they are partnering with MGM Television to develop and produce shows for the social network's Discover platform. We're very excited to see how MGM television discover shows for Snapchat turn out. With Snapchat also working with Disney on similar content, this could be the start of a fantastic new type of video content. "Snapchat Shows are original stand-alone four- to five-minute pieces of programming produced and shot vertically for mobile." While there have been a lot of questions surrounding Snapchat and how they plan to grow, it's clear that they are thinking about mobile TV differently than other social networks. We can't wait to check out MGM Television shows produced for Snapchat. To read more about the Snapchat and MGM deal, take a look at this article. Also in Snapchat news, Hootsuite has acquired Nartiv, a Snapchat analytics solution. This is a great move for Hootsuite. This is because there are very few Snapchat analytics solutions. By acquiring Narativ, a popular tool for measuring Snapchat analytics, Hootsuite seems to be positioning themselves ahead of the competition such as Buffer or Co-Schedule. For example, an advertiser might use this to drive app installs, web views or even movie trailers. Not only will this give Hootsuite a head start as more and more businesses increase their Snapchat usage, if you're a Hootsuite user, this means you'll also have Snapchat functionality within Hootsuite. You can read the announcement from Hootsuite here. The first tool we have for you this week is called Swipeable (iOS). Swipeable is an app that can take your panoramic photos and turn them into Instagram multiple photo and video carousel posts. 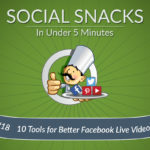 We've spent time in our social media test kitchen and absolutely love this app. You can create beautiful images that can engage your audience on Instagram. Download the free Swipeable app below and take a panoramic photo. In seconds, you can make your panoramic photos swipeable on Instagram! The next tool we wanted to share with you is called Patch (iOS). Patch is a smart portrait editor for your mobile device. With Patch, you can add artistic depth effect to portraits. For example, you can use your finger and quickly blur the background. Typically, you need the latest mobile device, such as an iPhone 7 Plus with a dual-camera or expensive professional camera and lenses to create this effect. Patch is a free app. You can download it from the link below. That's it for this week's episode of Social Chatter.